This was my Christmas present this past year. He is rotten to the core and tired of having his picture made! 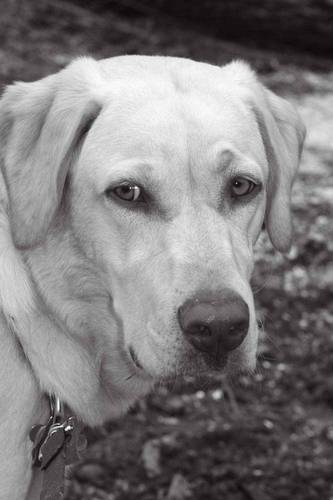 Hunter is a yellow lab. Nice portrait! Hunter seems to have mastered that retriever "put upon" look of reluctant obedience. Labs, goldens, and the other retrievers are all great dogs! Hi Tanya, good to see you here. Great image of Hunter. We have 2 yellow Labs also, - Maggie and Lucy, ages 11 and 7. Maggie we raised from a very young pup to be a Guide for a visually impaired person, but she failed the final part of her training, so we bought her from the BC Guide Dog group.